kaitlyn weaver Photos, News, and Videos | Just Jared Jr.
Madison Chock & Evan Bates Win Silver at ISU Grand Prix of Figure Skating! 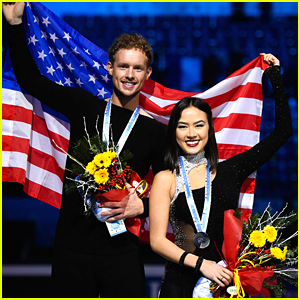 Evan Bates and Madison Chock hold the American flag up during the medal ceremony at the ISU Grand Prix of Figure Skating Final 2014/2015 held at Barcelona International Convention Centre on Saturday night (December 13) in Barcelona, Spain. The Olympic ice dancers took the second place spot, grabbing the silver medal just after Canada’s Kaitlyn Weaver and Andrew Poje, who took the gold. Alex and Maia Shibutani placed 4th with 158.94. “A year ago if you told us we’d be second at the Grand Prix Final, we would definitely both be ecstatic about that,” Evan shared with press after their win.